DCB-12ML Deluxe Cash Box is rated 3.5 out of 5 by 2. The Master Lock Deluxe Cash Box DCB-12ML is built with solid steel to provide reliable and durable protection for your valuables. 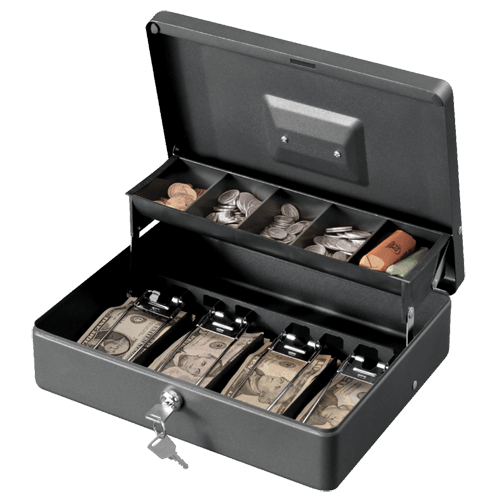 The DCB-12ML includes a removable cash drawer and bill clips to keep your cash, coins, receipts and checks organized. Rated 2 out of 5 by Luis Martinez from springs on bills arm I really enjoy this box and has served its purpose. The only down fall for this box is that the springs that help keep the bills arm down are very weak. All of the bill arm springs have broken and can not find replacement springs. I purchased another box and found the same thing happening to the second box with in hours of using it. the box is great but need improvement on better springs.